Steamed pudding logistics: this is not half as tricky as you think, and you probably already have everything you need. We used a 6-cup ceramic mixing bowl for the pudding mold, but if you inherited your great-aunt’s fancy metal mold with its convenient lid, by all means give it a whirl! Get out your spaghetti pot, and try to rig things so that the mold will sit at least an inch, or two, off the bottom; I use a vegetable steamer topped with a smallish round cooling rack. (In the past, I’ve cut the tops and bottoms out of big tuna cans, and securely balanced the mold on them in the bottom of the pot.) The point is to have a good deal of water in the pot so you get plenty of steam. If you start with less than 2 inches of water, be sure to check the level during the steaming process; top off with boiling water if necessary. First, set up your steaming arrangement, making sure it all works while it’s nice and cool. Then add the water and set it on to boil. In a separate mixing bowl, whisk the egg, adding the molasses and then the hot water. 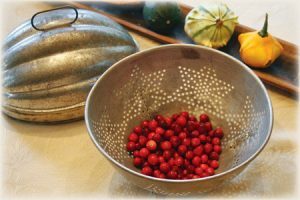 Toss the halved cranberries in the dry ingredients, and add to the molasses mixture. Stir together briefly with a rubber spatula and turn the batter out into your ungreased mold, smoothing the top. Top with some foil, folding the edges tight against the sides of the bowl (or, of course, use the mold lid if you have one). Ease the mold onto your steamer rack. (Protect your hands with dishtowels or oven mitts —as you may know, steam can be hot!) Cover, adjust the heat for an aggressive simmer, and steam 1 hour and ten minutes. When the pudding is done, a wooden skewer poked in the center will emerge clean. Let the pudding cool in its mold at least 10 minutes. Unmold onto a serving plate and serve in wedges with warm butter sauce. Add sugar and cream and stir until sugar melts and sauce is quite warm. Do not boil. Stir in vanilla and serve warm over the pudding.